Although the federal government cannot technically become insolvent; there are other undesirable consequences to exceeding its constitutional duties. While the national debt is not exactly like a household debt, since the federal government is technically a “sovereign currency issuer”, it still has to be paid with interest like a household debt and that interest payment is growing rapidly. In fact, according to CBO net interest on the national debt is the fastest growing portion of the congressional budget. CBO estimates that net interest on the national debt will grow by 248% over the next decade, much faster than GDP growth over the same time period (55%) or any category of congressional spending including healthcare spending (96%). In the current fiscal year, congress spent nearly $400 billion paying the net interest on the national debt, about 9% of the total congressional budget (both discretionary and non-discretionary). This exceeds the amount spent on programs like SNAP, SSI and unemployment benefits. 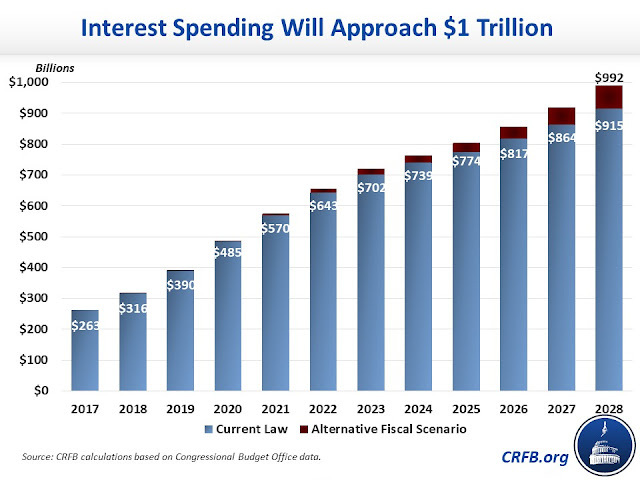 By 2028, the net interest on the national debt will climb to at least $914 billion or as high as $992 billion, constitute 3% of GDP, and exceed all categories of discretionary spending including defense spending. The U.S. is expected to pay approximately $7 trillion in interest on the national debt for the next decade. It should be remembered that discretionary spending, currently about $1.3 trillion, is only a fraction of the annual congressional budget; in fact, it is less than half the budget. Most of the budget is non-discretionary or mandatory spending that congress does not get to approve on an annual basis. Any attempt to “balance the budget” through spending cuts or tax hikes would be futile. This case pertains to a four year old child, identified pseudonymously as I.B. in the amicus brief, who was strip searched against her will and photographed by a CPS caseworker at preschool. The strip search was conducted as part of a child welfare investigation without probable cause that the little girl had been physically abused or neglected. The little girl’s horrified mother immediately contacted the preschool, but the teachers assured her that nothing had happened. Unsatisfied, Jane continued to press the school on the issue. Weeks later, the school finally revealed that, during a child abuse investigation, a caseworker, Ms. Woodard, had strip-searched I.B. Aside from concerns about the constitutional rights of parents and the psychological harm that strip searches and ‘genital examinations’ may inflict on children, this also brings the privacy rights of children to the forefront. Children have the same human rights, and ,to a certain extent, the same constitutional rights (delineated in the bill of rights), as adults. Sure children cannot vote, hold public office, enter into contracts, consent to participate in scientific studies, drive or consume alcohol but this is due to diminished autonomy rather than an absence of rights. The same restrictions often apply to adults with mental and physical disabilities, yet they are not stripped of their constitutional and human rights and relegated to an inferior legal status like convicted criminals. Likewise, a person who becomes unconscious doesn’t suddenly lose their rights and then regain them upon regaining consciousness. 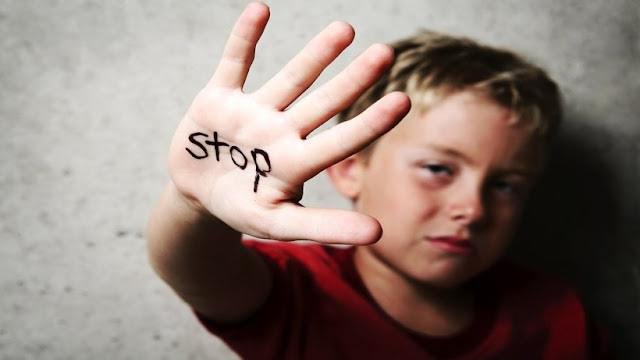 In relation to actions taken by the state or any public authority, children have the same rights as adults, which includes the right to privacy and the right to refuse unreasonable searches and seizures; these rights do not suddenly kick in at a certain age. Although a special exception could be made for infants and other children who are non-verbal, and we would have to defer to the mother or caretaker, we should recognize that just as children are not subject to the arbitrary and capricious will of their parents or guardians (i.e. restrictions on child abuse) they also should not be subject arbitrary and capricious actions of the state or public authorities (e.g. privacy rights). The fact that children are usually unaware of their rights makes this even more critical. In this case a Jehovah's Witness was convicted of trespassing for distributing religious literature in the town of Chickasaw, Alabama, which was privately owned by the Gulf Shipbuilding Corporation. Company policy prohibited solicitation of any kind, including the distribution of literature, on the privately owned streets and sidewalks. The Jehovah's witness was told she would not receive permission to proselytize and was asked to leave Chickasaw altogether. The Jehovah's witness protested this decision on first amendment grounds and was promptly arrested by a sheriff's deputy for criminal trespassing. The Supreme court eventually concurred in the Jehovah's witness's favor overturning the conviction and noting that the relevant distinction between where the first and fourteenth amendments are applicable and where the are not is not whether a place is owned by a government or private entity, but the function it is commonly used for. The State (of Alabama) urges, in effect, that [p506] the corporation's right to control the inhabitants of Chickasaw is coextensive with the right of a homeowner to regulate the conduct of his guests. We cannot accept that contention. Ownership does not always mean absolute dominion. The more an owner, for his advantage, opens up his property for use by the public in general, the more do his rights become circumscribed by the statutory and constitutional rights of those who use it. Cf. Republic Aviation Corp. v. Labor Board, 324 U.S. 793, 798, 802, n. 8. Thus, the owners of privately held bridges, ferries, turnpikes and railroads may not operate them as freely as a farmer does his farm. Since these facilities are built and operated primarily to benefit the public, and since their operation is essentially a public function, it is subject to state regulation. This aptly describes social media platforms like Facebook, Twitter, LinkedIn and YouTube. They are open for use by the general public, without charge, and function as forums for spreading ideas (both religious and secular), engaging in political discourse, and even advertising business the same way we used open public spaces such as side walks, parks and town squares in 1945. All of these large social media platforms are, in fact, public forums subject to first amendment protections. The fact that they are owned by 'private companies', a description which is a misnomer itself, is irrelevant. The entire argument that 'private companies' can do what they want rests on the mistaken belief that there is a single set of property rights protected by the non-existent legal doctrine of absolute property rights, which is found nowhere in the laws of any country, much less our own. Calling social media platforms 'private companies' is also a disingenuous red herring; they are public corporations charted by the states, in which they operate, for the purpose of providing a benefit to the public under their articles of incorporation. They are categorically different from proprietors, colloquially referred to as 'mom and pop shops' or simple fee owners of real property; comparing the two not only makes you a moron, but a belligerent moron to boot.